E-mail marketing is a great way to stay in touch with your customers on a regular basis and provide updates your latest news or promotions, directly to their inbox. Our software offers reliable and secure e-mail distribution and will also provide you with valuable customer insight and information to help you make future marketing decisions. NEED: The Joseph Richard Group was in the midst of expanding from two stores to what would soon be over twenty and was looking to build a customer database and loyalty program via e-mail marketing. 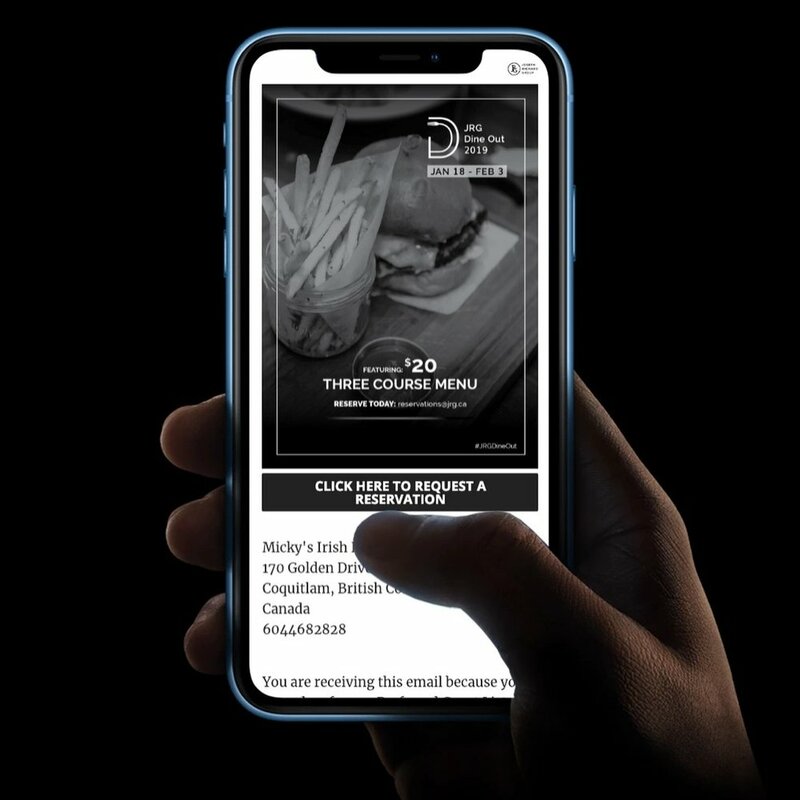 SOLUTION: We built a customized e-mail marketing template that highlighted upcoming events, new menu items and future promotions so that JRG’s guests would be up to date on company happenings. We also built automated messaging to provide guests special birthday and anniversary offerings. RESULTS: Since its inception, the JRG e-mail marketing list has reached over 50,000 guests providing an excellent avenue for the company to reach its customers and cross promote when new locations open. The birthday and anniversary automated messaging has also helped increase business by 5-10%. NEED: Waterfront Health & Wellness had just launched and had an influx in inquiries as the result of a TV appearance on a local news station explaining the procedure and the advantages it has. Overnight, the amount of people reaching out to explore the potential of regenerative therapy almost quadrupled the company’s database. Quickly, they need to get those people into an information pipeline to ensure communication lines were open and consistent. SOLUTION: In less than 24 hours, we built a custom e-mail marketing template to highlight the procedure and integrate a recent video shoot to help patients understand what they were considering and the medical advantages of the procedure. RESULTS: Upon launching the e-mail marketing campaign, Waterfront’s patient redemption rate increased by 30% and the list has steadily grown by 20% per week.